May 1, 2012, May Day, I was out live webcasting in NYC via iPhone/UStream, once early in Union Square and then at the end near Wall Street. In between I watched other live webcasts, most notable Tim "Timcast" Pool. The goal was to further understand the current tech, the challenges and social dynamics, and what can be generalized beyond Occupy. 80% young hipsters ("Brooklyn"), 20% "soixante-huit"ers (both Laurie Anderson and Stewart Brand recently told me that they think Occupy is the most interesting thing right now). Loud but relatively little anger. No prominent booze or rowdiness. In Union Square, there was a large meditation circle on a closed-off street. There were thousands of police, and I saw only one arrest. While webcasting at the front line when the police pushed in, tension went up to a "4" (of 10), a little scary. 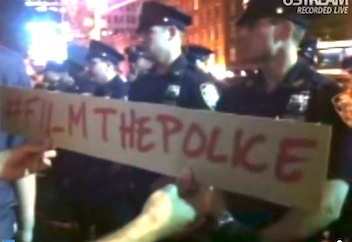 A guy nearby held a sign "Film the Police" and everyone did, constantly, to the point of visible discomfort for them. The cops not in lines were friendly and NYC wiseguys ("OK to cross the street here?" "Only if you look both ways first."). Most everyone, of course, had smart phones, and many carried standalone cameras. The amount of shooting (and being the subject) was unlike anything before, not even a year ago, and I'm convinced signals something very new and significant. As far as I could tell, most were shooting still photos and SMS/tweeting; some were recording video; and <1% were webcasting live. There were a lot of DIY camera hacks - cameras with duct-taped shotgun mics, iPhones on sticks, hat and helmet cams - all presumably for recording video. Coolest was a trombone player with an iPhone/UStream setup gaffered on her horn facing out. I could read that she had 40-some live viewers and several chat comments. Noteworthy: many indy camera/hacker/activists were women. The UStream app didn't, as promised, send out a FB/tweet every time I began webcasting, which really sucked. I sent out a couple on my own but as general notices. Audiences went as high as 5 viewers (woo hoo! ), and there's a very real thrill every time the view count increments, even by one. I received one realtime SMS from a friend and an email the next morning from someone who was watching, but oh how I longed for feedback, any feedback. Without feedback from viewers, it was uninteresting chatting/interviewing, though I did do some live narration (alas, into the void). Most folks didn't seem to mind the presence of my (or any) camera. The police couldn't, presumably by fiat, but there was clearly a delicacy in the general crowd about proximity, especially by people talking with other people. Incidentally, this is mostly due to the fixed, wide-angle, lenses on smartphones. Photojournalists know better. I mostly wandered and assumed my audience wanted mostly ambience. There was a "kbps streaming" readout, but my display didn't show what the viewers actually saw, which would have informed my walking and panning speed. Everything was auto-recorded and I've now looked at a bit. From a recorded material perspective, maybe 2% is interesting. With the right UI, this could have been flagged in real time, either by me or by viewers. As an old camera guy, I have a lot to say about smartphone camera design. Wobbly without shoulder anchor. Fatiguing to hold. No "smart" stabilization. No zoom. No viewfinder. Omni audio. That the out-facing camera is referred to as "rear" sums up the phone manufacturer's priority. Lots of opportunities here, and we're seeing some appear on Kickstarter. First and foremost, having an active group of "operator assistants" would make a world of difference for final output quality, editorially and aesthetically, to a larger audience. Knowing about other webcasters and coordinating with them would be cool and useful. Some may even be registered "on-call" and get a pushed notification to fire up their camera. The ambience of "seeing through someone else's eyes" is a well-documented vision (e.g, some friends once proposed a "rent an eyeball" system for a world expo), but the rules for shooting and interacting are yet to be discovered. All (ALL!) of the current UI/UX for finding live video with the big players - UStream, Livestream, Justin, Qik, Bambuser - are problematic. Search, say, "squirrel", then try to figure out what's live or not, how many viewers are/were watching, etc. A VC friend who's an investor in UStream confided to me that they don't make their money from random viewers, so there's little incentive for improvement. Finally, it's clear that Occupy (and Arab Spring and Campaign 2012) has attracted the most tech-savvy early adopters in the live mobile video space, so regardless of one's politics, this is the use-case to watch, as these technologies and apps spread to soccer moms, college professors, bar bands, and child chefs. Here's a 2.5 minute roughcut.